As a beginner, you’ll likely want to use a soft, wide board, which offers more floatation and stability for you as you ride the waves. Don’t be afraid to ask the professionals for some advice, as choosing the wrong board could stunt your learning curve and make the first few lessons much harder. Here at Outdoor Adventure, we’ll ensure that you have the correct board for both your proportions and skill level. Lie on the board, sit on the board, stand on the board, get to know how it feels and how it moves. You can do this on the sand, which is a great time to practice the moves you will need to perfect in the water. The stability of the sand will help you get to grips with the basics before moving onto the fluid terrain of the water. As you probably know, there is a correct attire for surfing. Classically a wetsuit and rash vest, which you can usually rent these nearby to your surfing destination. Ensure that the wetsuit fits correctly to make sure that you are both suitably protected and comfortable! Before entering the sea, take a little time to learn the basics of ocean safety, and ensure that you can swim a reasonable distance unaided. A few things you should be aware of are; the conditions of the day, make sure you sun cream up if necessary, and check for any dangerous stormy weather. You should also take a little time to learn what the different warning flags mean on the beach, and be sure to keep an eye out for any flags that may mean danger. When learning to surf you should have confidence, as this will help you to stand up more quickly. Having a little faith in your abilities can go a long way; if you believe you can then you probably will! Don’t get overly confident, though, as this can lead to you making silly mistakes that may be very dangerous. You must find a solid balance between the two extremes to help yourself learn to surf! 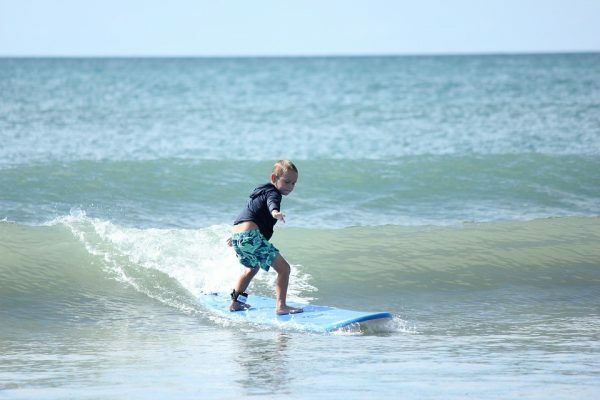 Although some prefer to learn through trial and error alone, we certainly recommend taking a few lessons to begin your surfing hobby. This will ensure that you learn all the vital basic skills from a professional and don’t skip out on anything important. Even if you do not plan to continue taking lessons, just a few to get you started should give you a great head start. This may also boost your confidence a little knowing that you’ve got a pro nearby! Our outdoor activity centres UK can provide you with fantastic lessons, as well as equipment to help you get up and going in no time! Like any exercise, you should warm up before taking on a strenuous activity. Just a light warm up to stretch out your muscles can help to avoid any injuries or strains that you may incur whilst out riding the waves. This is an important step for both beginners and professionals, so don’t start slacking off once you get better at surfing! You will need to get to know the waves a little to know what kind of surf you can handle. The only way to do this is through observation and trial and error. Take note of the details of the daily surf and get to know a little about the surfing lingo. This will help you to gauge whether or not you can handle those conditions and save you from any nasty accidents.